You have to hand it to the men's grooming industry. Faced with shrinking razor blade market share because more men sport beards, it has had to come up with inventive ways to sell more of its products. It continues to re-invent the razor, with more and more cutting edges. One of the most innovative developments has been the subscription razor blade service. For a flat fee a consumer receives a package of blades each week or month. The selling point is that you'll never be caught one morning with a dull blade and no replacement. The downside is that you will buy more razor blades than you could ever use. That is, if you properly care for your razor. The truth is that commercial razor blades – both cartridges and disposable razors – can last weeks or months with proper care. Though we haven't tested them all, we've gathered some methods from a variety of sources who swear by the results. The reason you have to eventually replace a razor blade is the damage caused by water. When water dries on the blade it creates oxidation and microscopic rusting. Corrosion can even cause the metal to flake off and the edge to become jagged. That's what gives you a rough shave. To prevent this oxidation you simply need to remove the water from the blade after each shave. Just storing the razor with the blades pointing up will help. The blades will dry more quickly than if they are pointing down and making contact with a solid surface. One way to extend blade life even more is the “blue jean method.” People who use it claim to use the same blade for six months or longer. When you finish shaving, take a pair of blue jeans and stroke the razor along the entire length of a leg between 10 and 20 strokes. That not only dries the blade but removes any tiny particles that may have stuck to the blade. Since the threads of the denim run in a diagonal pattern, switching directions during the process allows for a more balanced cleaning. This is similar to the way old-fashioned straight razors were sharpened in the past, on a leather strap. In this case, though, you aren't really sharpening the blade as much as you are simply cleaning it. Another easy way to prolong blade life is to thoroughly dry it after each use. Once the blade has been rinsed, wipe it on a towel, then use a hair drier to remove all water. If you want to go a step farther, some suggest dipping the blade in either mineral oil or almond oil. The theory is these lubricants will act as a sealant against corrosion and oxidation. Finally, how and where you store the razor between shaves is also very important. As noted earlier, it's best if the blades are not touching a solid surface. If you shave while in the shower, don't leave your razor there. Instead, find a cool, dry place – which might rule out the bathroom altogether. Over the years razor companies have responded to declines in blade sales by inventing some kind of fancy new razor. A single blade went to two blades, then three – now five! Last June Gillette launched its first new razor since 2010 – the “Fusion ProGlide with FlexBall technology.” The razor has a swiveling ball attached to the blade. Gillette claims it is 20% more effective at eliminating hairs. 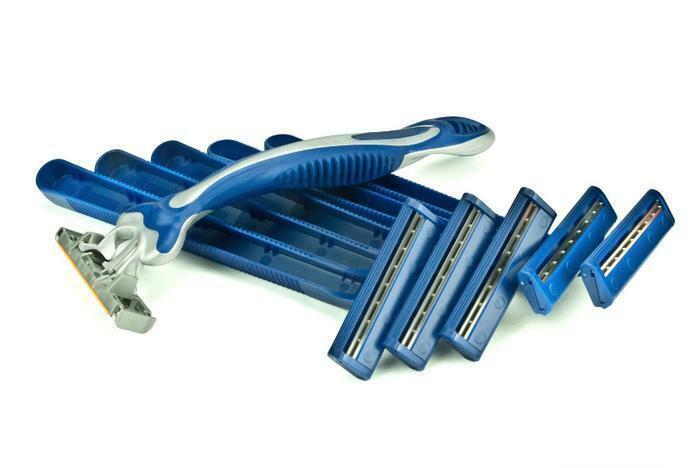 In reporting the product launch CNBC noted that razor sales have fallen significantly in 16 of the last 17 months. Either more guys are wearing beards, or have figured out they don't really need to change blades every week.